Doctor Who fans who have been on the fence about checking out the ACE Comic Con coming to Navy Pier next weekend (October 12 ­­– 14) should no longer have any doubts. 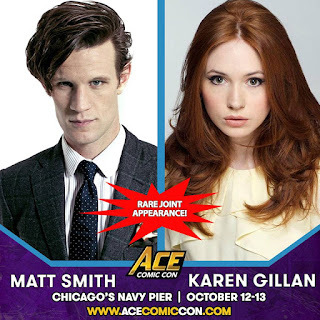 Matt Smith, who portrayed the 11th version of The Doctor, and Karen Gillan, who was his companion Amy Pond on the British sci-fi show, have recently been announced as guests, Following his tenure on Doctor Who, Smith went on to portray Prince Phillip on The Crown, and Gillan is well known as Nebula in the Guardians Of The Galaxy franchise. She also recently wrote, directed and starred in the independent film The Party’s Just Beginning. Hopefully, we’ll have a chance to catch a screening of that at some point in Chicago. Irish Vacation Lore Part 1: Pam and I just returned from a 10-day trip to Ireland. We opted for a country-spanning bus tour, with Irish-born/Chicago-based singer Paddy Homan as our guide. We traveled to Cork, Killarney, the Dingle Peninsula, Ennis, Galway, and Dublin to experience the country’s historic sites and stunning natural beauty. We also dropped by pubs to watch local musicians performing jigs, reels, and traditional folk songs. On a few occasions, Homan joined them onstage. The Chicago TARDIS Convention, coming to Westin Lombard Yorktown Center in Lombard on November 23 – 25, continues to entice Doctor Who fans. Pearl Mackie, who played Bill Potts during Peter Capaldi’s take on The Doctor (he followed Smith), will be on hand, and more recently, Jenna Coleman (Clara Oswald) has been added to the guest list. The next season of Doctor Who, with Jodi Whittaker taking on the title role, kicks off tonight on the BBC. It will be interesting to see how Whittaker, the first woman to portray The Doctor, survives last seadon’s cliffhanger of being jettisoned from the TARDIS. If you’re planning on hosting a holiday party this December, imagine the look on your guests’ faces when you greet them at the door dressed as Old Fezziwig. That might be possible if you check out the Goodman Theatre’s Costume Sale on Saturday, October 20, 9:00 a.m. – 2:00 p.m. I have no idea what costumes will be on sale, but The Goodman has been doing its critically acclaimed production of Charles Dickens’ A Christmas Carol for decades. You might even find a Tiny Tim costume for one of your kids. God bless us, everyone. Irish Vacation Lore Part 2: We had the same driver throughout our bus tour. Austin (Pam and I aren’t sure if he and our fellow travelers would want their full names used here) was a super hero in terms of navigating the country’s notoriously tricky roads under any circumstance. He also regaled us with hilarious tales and informative commentary of Ireland’s monuments and history. A number of local musicians, including Phil Angotti, Tommi Zender, Casey McDonough, Joe Camarillo, and Tony Ryan will be gathering at City Winery Chicago this Sunday at 1:00 p.m. for A John Lennon Birthday Retrospective. All of these guys have extensive experience putting on tribute shows , and most have performed on the Apple Jam Stage at Fest For Beatles Fans – Chicago. Irish Vacation Lore Part 3: It should come as no surprise that I was on the lookout for record stores during this trip. In Dublin, Pam helped me find Tower Records, the last remaining location for the once global record store chain. Stopping there brought back fond memories of when I visited the Tower Records in Hollywood while on a California vacation in 1980, and from when lived just around the corner from the Tower Records in Lincoln Park. The Dublin version did not disappoint. I browsed through CDs, vinyl records, magazines, and assorted rock-related memorabilia. I bought a Kinks coffee mug, a seven-inch picture sleeve 45 of “Fire Burning” by Irish rockers The Urges, and a Tower Records Dublin t-shirt. From there, we walked a few blocks to the Hard Rock Café where I picked up a few more souvenirs. Earlier on the trip, we stopped in The Record Rack store in Ennis, where I bought a Bangles “In Your Room” seven-inch picture sleeve 45, and a 1980 copy of a UK magazine called Rock Compact Disc. Tellin’ Tales Theatre will wrap up Six Stories Up In Climate Change, the latest installment in its long-running Six Stories Up series, this weekend at the Filament Theatre. The musical comedy, written and performed by middle school students and adult mentors with and without disabilities, is set in Alaska delivers a timely message about saving the environment. Tickets are $20 for adults; $15 for children. Filament Theatre is located at 4041 N. Milwaukee Avenue in Chicago. Irish Vacation Lore Part 4: Another benefit of our bus tour of was becoming part of a friendly and fun group of travelers, Several had been on bus tours in Paddy Homan in previous years. Since most of us came from Chicago, it’s a safe bet we’ll be keeping in touch—probably at on of Homan’s Sunday night gigs at the Galway Arms venue on Fullerton. Irish Vacation Lore Part 5: Gee, but it’s great to be back home. I mentioned Doctor Who in a few paragraphs earlier in this post. Pam and I could have used The Doctor’s help in getting back to Chicago. Our Friday morning flight out of Dublin was delayed five hours before being canceled, and our Saturday afternoon flight was delayed 45 minutes. It would have been great to hop into the TARDIS and delivered to Chicago at the originally scheduled time. Having our trip back delayed a day and a half demolished the plans Pam and I had for using this weekend to celebrate our wedding anniversary. (It’s October 5.) We didn’t get home until 11:30 last night. I want to wish Pam a happy anniversary and thank her for all these wonderful years and being such a fun and knowledgeable travel companion. Pam, I love you!